Within each group, the works are presented in chronological order, without reference to format (book, article, website, etc. ), although I have flagged peer-reviewed works with [pr]. URLs are provided either to online works or to PDFs (for the more important works) that can be downloaded. All works are only by myself, unless noted. I do not list blog entries. I thought, as an undergraduate, that I would become a professional land surveyor. Within the University College London geography program (1980–1983), I also had occasion to develop some skills in computer mapping. “The Computer-Based Construction of Map Projections.” B.Sc. (hons.) dissertation (Geography). University College London, 1983. I did not forego my interest in surveying as I developed my historical interests at the University of Wisconsin–Madison (1983–1990), which remain predicated upon my fascination with the practices, technologies, and institutional contexts of the surveying and mapping of property and landscapes. In particular, my graduate studies explored the intersections of systematic, geodetic-based surveys with both state formation in the nineteenth-century (re USA) and imperialism (re British India). These interests subsequently remained important to me, and have resurfaced as I have reconsidered the ideal of “cartography” (section 4, esp. 4.2 and 4.4). “Politics, Science and Government Mapping in the United States, 1800 to 1925.” M.S. thesis (Cartography). University of Wisconsin–Madison, December 1985. “The Ordnance Survey and British Surveys in India.” Sheetlines: Newsletter of the Charles Close Society, no. 26 (December 1989): 3–8 and no. 27 (April 1990): 9–10. 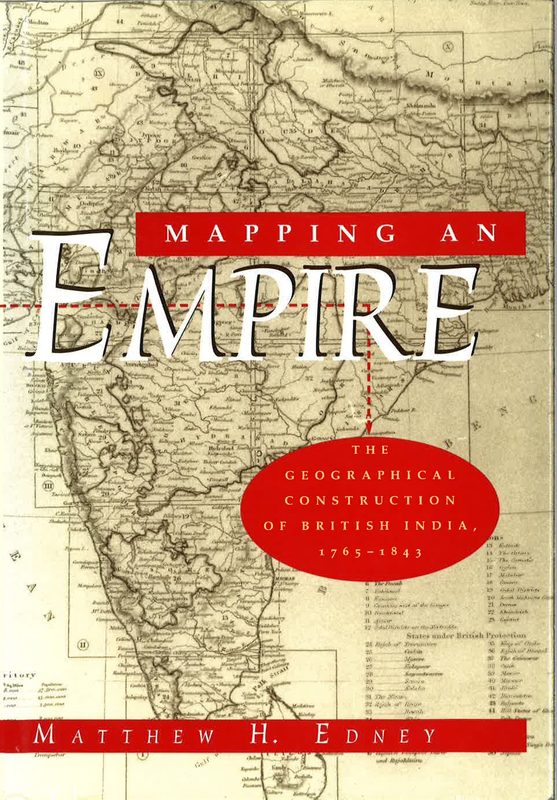 “Mapping and Empire: British Trigonometrical Surveys in India and the European Concept of Systematic Survey, 1799–1843.” Ph.D. dissertation (Geography). University of Wisconsin–Madison, 1990. “Systematic Surveys and Mapping Policy in British India, 1757–1830.” In Colonel Sir George Everest CB FRS: Proceedings of the Bicentenary Conference at the Royal Geographical Society, 8th November 1990, edited by James R. Smith, 1–11. London: Royal Geographical Society and Royal Institution of Chartered Surveyors, 1990. • Reprinted, New Delhi: Oxford University Press, 1999 (ISBN 019–565172–3). “Defining a Unique City: Surveying and Mapping Bombay after 1800.” In Bombay to Mumbai: Changing Perspectives, edited by Pauline Rohatgi, Pheroza Godrej, and Rahul Mehrota, 40–57. Bombay: Marg Publications, 1997; reprinted, 2001 and 2007. • Simultaneous published in Marg: A Magazine of the Arts 48, no. 4 (1997): 28–45. “The Ideologies and Practices of Mapping and Imperialism.” In Social History of Science in Colonial India, edited by S. Irfan Habib and Dhruv Raina, 25–68. New Delhi: Oxford University Press, 2007. The Surveyor as a ‘Madman.’ Commentary for Annual Broadsheet, no. 15. Madison: The Silver Buckle Press, University of Wisconsin, for the History of Cartography Project, 2007. “Napoleonic Plan of Boulogne’s Defenses.” Map commentary for the Osher Map Library, 2013. Considering the development and idealization of the modern systematic survey (section 2) led me to explore the earlier ideals and practices of mapping in eighteenth-century Europe. Originally (after 1990) I sought to explore this in terms of “Enlightenment science” generally and in North America more particularly. Starting in 2000, I sought to explore “Enlightenment” ideals in the context of “public” discourse (what some people have called “print culture,” although I find this a remarkably unhelpful term when dealing with the intersections of manuscript and print circulation). By 2018, this interest had been subsumed into my general concern for mapping processes (section 4). “Cartographic Confusion and Nationalism: The Meridian of Washington, DC, in the Early 19th Century.” Mapline: Newsletter of the Hermon Dunlap Smith Center for the History of Cartography at The Newberry Library, nos. 69–70 (Spring/Summer 1993): 4–8. “‘Analemmas’ on Globes.” Globe Studies: The Journal of the International Coronelli Society, nos. 64/65 (2018): 37–58. The Moon Mapp’d: Imagining a New World. Commentary for Annual Broadsheet, no. 14. Madison: The Silver Buckle Press, University of Wisconsin, for the History of Cartography Project, 2006. Stemming from my early work is a broad theoretical interest in the nature of maps, cartography, and their history. This interest has been increasingly influenced by Foucauldian discourse theory, the sociology of texts (especially in helping distinguish print from manuscript production), actor network theory, and historical linguistics. My specific arguments for a processual approach to map history were solidified in designing the encyclopedic structure of Volumes Four through Six of The History of Cartography. They have since continued to develop and have permitted complex overviews of large swathes of map history and of the idealization of cartography. Indeed, they have segued into an explicit concern to ground map studies generally in an “historical understanding” of mapping as process. In emulation of Jeremy Smith’s An Historical Study of English (1996), I thought to prepare a similar work, An Historical Study of Mapping, which has necessarily grown and spawned several books: Cartography: The Ideal and Its History (2019) and two works currently in preparation, specifically Mapping, History, Theory (section 5) and Mapping as Process. 4.1) Early Statements re "modes"
[Untitled] In “Responses to J. B. Harley’s Article, ‘Deconstructing the Map,’ Published in the Last Issue of Cartographica (Volume 26, Number 2, Summer 1989, pp. 1–20),” edited by Edward H. Dahl, 93–96. Cartographica 26, nos. 3–4 (1989): 89–121. “Mapping and the Early Modern State: The Intellectual Nexus of Late Tudor and Early Stuart Mapping. Essay review of Richard Helgerson, Forms of Nationhood: The Elizabethan Writing of England (Chicago: University of Chicago Press, 1992).” Cartographica 29, nos. 3–4 (1992): 89–93. • Reprinted in Mapping, ed. Martin Dodge, 4 vols. (London: Routledge, 2015), 1: item 10. • Reprinted in Human Geography, edited by Derek Gregory and Noel Castree, 5 vols. (Thousand Oaks, Calif.: SAGE, 2012), 2:271–96. One of just three papers on cartography (with another three on GIS) among eighty essays. • Excerpted in The Map Reader: Theories of Mapping Practice and Cartographic Representation, edited by Martin Dodge, Rob Kitchin, and Chris Perkins (Hoboken, N.J.: Wiley-Blackwell, 2011), 73–82. • Reprinted in Classics in Cartography: Reflections on Influential Articles from Cartographica, edited by Martin Dodge (Hoboken, N.J.: Wiley-Blackwell, 2011), 305–29. • Reprinted as “Teoria e história da cartografia,” Trans. André Reyes Novaes. Espaço e Cultura, no. 39 (2017): 7–18. “Cartography, Disciplinary History”; “Geography, Disciplinary History”; and “Geography, The Word.” In Sciences of the Earth: An Encyclopedia of Events, People, and Phenomena, edited by Gregory A. Good, respectively 1:81–85, 1:277–82, and 1:298. 2 vols. Garland Encyclopedias in the History of Science, 3. New York: Garland, 1998. Volumes 4 and 6 of The History of Cartography were designed in 2001–05, according to my early conception of cartographic modes; volume 5 necessarily inherited the same fundamental structure. My entries in each volume explaining the application of this structure to each time period might all appear to be late statements, according to their publication date, but they were all written in 2010–11 and as such still manifest my early conceptions. [Helen Wallis and mhe] “Cartography.” In Companion Encyclopedia of the History and Philosophy of the Mathematical Sciences, edited by Ivor Grattan-Guinness, 1101–14. London: Routledge, 1994. Reprinted London: Routledge, 2003; Baltimore: Johns Hopkins University Press, 2003. “Uncharted Territory.” Times Higher Education, no. 1819 (9 November 2007): 16–19. Implementing the volumes of the History and these overviews led me to revise both my understanding of modes and their classification in the Western tradition. 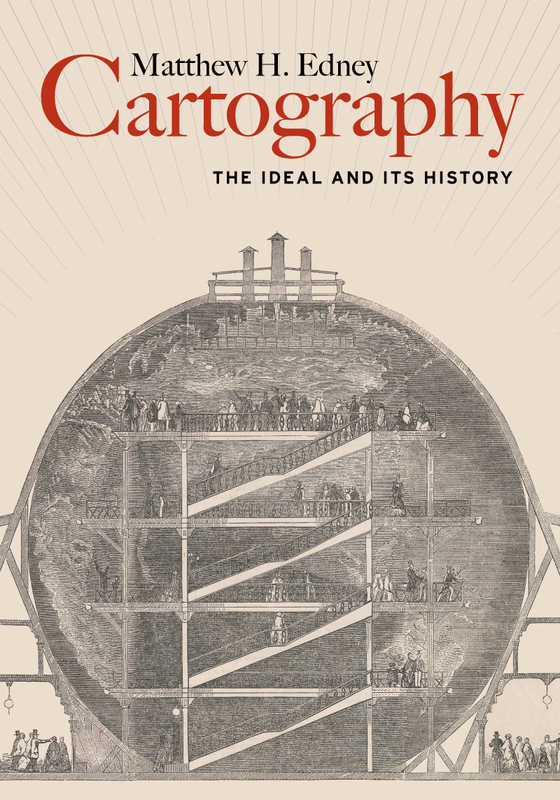 See also the introductory chapters to Cartography: The Ideal and Its History (2019; section 4.5). “Progress and the Nature of ‘Cartography.’” In Classics in Cartography: Reflections on Influential Articles from Cartographica, edited by Martin Dodge, 331–42. Hoboken, N.J.: Wiley-Blackwell, 2011. If mapping comprises a series of discrete yet intersecting modes, then what is cartography? The answer: an ideal that practitioners, scholars, and the public have sought to make real even as they pursue a variety of practices in line with the modes. “Mapping Empires, Mapping Bodies: Reflections on the Use and Abuse of Cartography.” Treballs de la Societat Catalana de Geografia, no. 63 (2007): 83–104. “Plus ça change: Defining Academic Cartography for the Twenty-First Century.” Essay Review of The Map Reader: Theories of Mapping Practice and Cartographic Representation, edited by Martin Dodge, Rob Kitchin, and Chris Perkins (Hoboken, N.J.: Wiley-Blackwell, 2011). Cartographica 47, no. 1 (2012): 66–71. A necessary component of my theoretical work has been the historiographical evaluation of the practices of map history since the 1700s. This work began with my detailed obituaries and reviews of the careers and significance of J. B. Harley and David Woodward, before I began to apply a processual approach to delineating the particular discourses of map history. A related endeavor has been the preparation of bibliographical introductions to the field of map history. “J. B. Harley (1932–1991): Questioning Maps, Questioning Cartography, Questioning Cartographers.” Cartography and Geographic Information Systems 19, no. 3 (1992): 175–78. “Works by J. B. Harley.” In J. B. Harley, The New Nature of Cartography, edited by Paul Laxton, 281–96. Baltimore: The Johns Hopkins University Press, 2001; repr. 2005. • Reprinted as “Obras de J. B. Harley,” in J. B. Harley, La nueva naturaleza de los mapas: Ensayos sobre la historia de la cartografia, edited by Paul Laxton (Mexico City: Fondo de cultura económica, 2005), 331–48. The University of Toronto Press put this monograph online as a series of separate chapters, but without the front matter and therefore without any indication either that I wrote the chapters or that they go together! “David Woodward: An Appreciation.” Cartographic Perspectives, no. 51 (Spring 2005): 58–59. “David Alfred Woodward (1942–2004).” Imago Mundi 57, no. 1 (2005): 75–83. “History of Cartography Project” (614–16). • Version 1.0 was originally prepared in 1998 for private circulation; version 1.1 was circulated online in 1999 for the Atlantic History seminar, organized by Bernard Bailyn at Harvard University (www.fas.harvard.edu/~atlantic/Bibliographies/bibliographyEdney.html). • Version 2.0 was published as Coordinates, ser. B, no. 6 (10 March 2006). • This work was, in large part, superseded in 2013 by my entry for Oxford Bibliographies. → www.oxfordbibliographies.com/view/document/obo-9780199874002/obo-9780199874002-0032.xml or DOI: 10.1093/OBO/9780199874002-0032 (subscription). • Reprinted with revisions and excisions in Critical Geographies: A Collection of Readings, edited by Harald Bauder and Salvatore Engel-Di Mauro (Praxis (e)Press, 2008), 711–28. “Cartography, History of”; “Geo-Body”; and “Map-Reading.” In The Dictionary of Human Geography, edited by Derek Gregory, Ron Johnston, Geraldine Pratt, Michael Watts, and Sarah Whatmore, respectively 69–72, 274–75, 439. 5th ed. Oxford: Blackwell, 2009. “Cartography’s ‘Scientific Reformation’ and the Study of Topographical Mapping in the Modern Era.” In History of Cartography: International Symposium of the ICA Commission, 2010, edited by Elri Liebenberg and Imre Josef Demhardt, 287–303. Publications of the International Cartographic Association, 2. Heidelberg: Springer for the International Cartographic Association, 2012. Mapping, History, Theory. In preparation. After moving to Maine in 1995, I focused my empirical studies on the mappings associated with New England, and British North America more generally, during the colonial era (especially from mid-seventeenth to mid-eighteenth century). My work on colonial mapping has been increasingly driven by a concern for the circulation of spatial knowledge in the transatlantic arena and more particularly in the functioning of public discourses (as part of a processual approach). In addition, my work within the Osher Map Library has inevitably led me to pursue a number of studies and commentaries on the mapping of Maine and the United States after 1783. As the conceptual and historiographical work took off (sections 4 and 5), I engaged much less in this body of empirical study; my unfinished essays were eventually published after 2019 as blog entries on this site. “The Basel 1494 Columbus Letter.” Online essay, published 14 October 1996. “The Cartographic Creation of New England.” Online version of exhibition text, published 6 November 1996. “Strategic Planning in the American Revolution: Hugh, Earl Percy and the Cartographic Image of New England in the Eighteenth Century.” Online essay, published 19 April 1998. “Eighteenth-Century Maps of New England and the Intersections of Manuscript Circulation and Print Publication.” In Actas = Proceedings = Comptes-rendus / XIX Congreso Internacional de Historia de la Cartografía = 19th International Conference on the History of Cartography = XIX Congrès International d’Histoire de la Cartographia: Madrid 1–6, VII, 2001, edited by Victoria Arias Roca, [Abstracts] 44–45. Madrid: Ministerio de Defensa, Secretaria General Técnica, 2002. “New England Mapped: The Creation of a Colonial Territory.” In La Cartografia europea tra primo Rinascimento e fine dell’Illuminismo: Atti del Convegno Internazionale “The Making of European Cartography” (Firenze, BNCF-EUI, 13–15 dicembre 2001), edited by Diogo Ramada Curto, Angelo Cattaneo, and André Ferrand de Almeida, 155–76. Accademia toscana di scienze e lettere “La Colombaria,” Studi 213. Florence: Leo S. Olschki Editore, 2003. “Maps.” In The Encyclopedia of New England: The Culture and History of an American Region, edited by Burt Feintuch and David H. Watters, 584–85. New Haven, Conn.: Yale University Press, 2005. “Puritan New England’s Precarious Perch on ‘this Western Coast.’” In The Map Book, edited by Peter Barber, 176–77. London: Weidenfeld & Nicolson, 2005. “Printed but not Published: Limited-Circulation Maps of Territorial Disputes in Eighteenth-Century New England.” In Mappæ Antiquæ: Liber Amicorum Günter Schilder. Essays on the occasion of his 65th birthday, edited by Paula van Gestel-van het Schip and Peter van der Krogt, 147–58. Utrechtse Historisch-Cartografische Studies / Utrecht Studies in the History of Cartography, 6. ‘t Goy-Houten, Neth. : HES & De Graaf Publishers, 2007. “Hugh, Earl Percy Remakes His Map of New England.” Portolan, no. 84 (2012): 27–37. “The Mitchell Map: An Irony of Empire.” Online essay, published 21 April 1997. • Reprinted as “A história da publicação do mapa da América do Norte de John Mitchell de 1755.” Trans. Júnia Ferreira Furtado. Varia História [Universidade Federale Minas Gerais], no. 37 (January­­–June 2007): 30–50. “‘The Most Important Map in U.S. History.’” Map commentary for the Osher Map Library, 2012. “Mapping the Republic: Conflicting Concepts of the Territory and Character of the USA, 1790–1900.” Online version of exhibition text, published 15 May 2003. “American Treasures.” Online version of exhibition text, published 18 October 2009. “The Historical Development of the Outline of the U.S.A.” First section of “Iconic America: The United States Map as a National Symbol,” guest curated by John Fondersmith. Osher Map Library, 2012. “Mapping U.S. History in the Early Republic.” Map commentary for the Osher Map Library, 2012. “The Eagle Map of the United States.” Map commentary for the Osher Map Library, 2014. (MHE, Jack Lamb, and George S. Carhart, comps.) “Bibliography of the Works of Moses Greenleaf.” In Walter M. Macdougall, Settling the Maine Wilderness: Moses Greenleaf, His Maps, and His Household of Faith, 1777–1834, 125–27. Occasional Publication of the Osher Library Associates, 3. Portland, Me. : Osher Map Library and Smith Center for Cartographic Education, University of Southern Maine, for the Osher Library Associates, 2006. “The Lessons of a Generic Map: The 1793 Map of William Bingham’s Maine Lands.” In “Cartographic Conversation,” edited by Jordana Dym. Providence, R.I.: John Carter Brown Library, Brown University, online 7 June 2012. “References to the Fore! Local Boosters, Historians, and Engineers Map Antebellum Portland, Maine.” Online essay, published 1 July 2017. Working in the Osher Map Library has led me to engage in a wide variety of subjects within map history. (principal curator) “Worldly Treasures: A Fifth Anniversary Celebration.” Osher Map Library, 1999. → www.oshermaps.org/exhibitions/world-treasures is the catalog. (MHE and Irwin D. Novak) “Editors’ Preface.” In Reading the World: Interdisciplinary Perspectives on Pieter van den Keere’s Map, “Nova Totius Terrarum Orbis Geographica ac Hydrographica Tabula” (Amsterdam, 1608/36), edited by mhe and Irwin D. Novak, ix. Occasional Publication of the Osher Library Associates, 1. Portland: University of Southern Maine for the Osher Library Associates, 2001. (George S. Carhart with MHE) “An Exercise in Map Genealogy: Guillaume Delisle’s L’Amerique Septentrionale and its Many Offspring.” Mercator’s World 6, no. 4 (2001): 44–49 and 6, no. 5 (2001): 28–35. “Mapping the Entire Cosmos: Heavens and Earth.” Map commentary for the Osher Map Library, 2012. “Maps as Commodities.” Map commentary for the Osher Map Library, 2013. “The Art of the Hand-Drawn Map.” Online version of exhibition text, published 16 October 2014. "Art of the Spheres: Picturing the Cosmos since 1600." Prepared with the assistance of Adinah Barnett. Online version of exhibition text, published 29 March 2018. Various commentaries on the field. “The Thirteenth International Conference on the History of Cartography, Amsterdam, 26–30 June, 1989: A Review and Perspective.” Cartographica 26, nos. 3–4 (1989): 121–27. “The History of Cartography and Cartographic Education: Responding to Institutional and Theoretical Changes.” In Proceedings of the Seminar on Teaching the History of Cartography II, held at The Newberry Library, Chicago, June 23, 1993, during the 15th International Conference on the History of Cartography, edited by F. J. Ormeling and Yde T. Bourma, 45–49. Utrecht: International Cartographic Association, 1994. (Yolanda Theunissen and MHE) “The Osher Map Library and Smith Center for Cartographic Education/Charting Neptune’s Realm: From Classical Mythology to Satellite Imagery.” Cartographic Perspectives, no. 36 (2000): 92–94. “Foreword.” In Edward V. Thompson, Printed Maps of the District and State of Maine, 1793–1860: An Illustrated and Comparative Study, vii. Orono, Me. : Stillwater Press, 2010. “Foreword.” In Mapping Latin America: A Cartographic Reader, edited by Jordana Dym and Karl Offen, xv–xvii. Chicago: University of Chicago Press, 2011. “Prologue.” In Sandra Sáenz-López Pérez, Marginalia in cARTography: Exhibition at the Chazen Museum of Art, Madison, February 28–May 18, 2014, 3. Madison: Chazen Museum of Art, University of Wisconsin, 2014. Not including longer, essay reviews classified by section, above. I have basically ceased writing book reviews: not enough time! Review of J. H. Andrews, Plantation Acres: An Historical Study of the Irish Land Surveyor and his Maps (Belfast: Ulster Historical Foundation, 1985). In Journal of Historical Geography 13 (1987): 76–77. Review of Walter W. Ristow, American Maps and Mapmakers: Commercial Cartography in the Nineteenth Century (Detroit: Wayne State University Press, 1985). In Journal of Historical Geography 13 (1987): 99–100. Review of James R. Smith, From Plane to Spheroid: The History of Geodesy from 3000 BC to 1750 AD (Rancho Cordova, Calif.: Landmark Enterprises, 1987). In Cartographica 25, no. 3 (1988): 115–17. Review of Gary L. Fitzpatrick, The Early Mapping of Hawai’i (Honolulu: Editions Limited, ca.1986). In Cartographica 25, no. 3 (1988): 142–44. Review of Josef Konvitz, Cartography in France, 1660–1848: Engineers, Scientists, and Statesmen (Chicago: University of Chicago Press, 1987). In Journal of Historical Geography 14 (1988): 72–73. Review of Richard A. Jarrell, The Cold Light of Dawn: A History of Canadian Astronomy (Toronto: University of Toronto Press, 1988). In Cartographica 26, no. 2 (1989): 123–24. Review of Barry W. Higman, Jamaica Surveyed: Plantation Maps and Plans of the Eighteenth and Nineteenth Centuries (Kingston: Institute of Jamaica Publications, 1988). In The Map Collector, no. 53 (1990): 48–49. Review of Thomas G. Manning, U.S. Coast Survey vs. Naval Hydrographic Office: A 19th-Century Rivalry in Science and Politics (Tuscaloosa: University of Alabama Press, 1988). In Cartographica 27, no. 1 (1990): 95–98. Review of David Buisseret, Historic Illinois from the Air (Chicago: University of Chicago Press, 1990). In Cartographica 28, no. 2 (1991): 100–1. Review of Stanley H. Palmer and Dennis Reinhartz, eds., Essays on the History of North American Discovery and Exploration (College Station: Texas A&M University Press, 1988). In Cartographica 29, no. 2 (1992): 66–67. Review of Susan Gole, Indian Maps and Plans from the Earliest Times to the Advent of European Surveys (New Delhi: Manohar Publications, 1989), and Maps of Mughal India Drawn by Colonel Jean-Baptiste-Joseph Gentil, Agent for the French Government to the Court of Shuja-ud-Daula at Faizabad, in 1770 (London: Kegan Paul International, 1988). In Cartographica 29, no. 1 (1992): 61–63. Review of J. B. Harley, Maps of the Columbian Encounter: An Interpretive Guide to the Travelling Exhibition (Milwaukee: The Golda Meir Library, University of Wisconsin–Madison, 1990), and Kenneth Nebenzahl, Atlas of Columbus and the Great Discoveries (Chicago: Rand McNally, 1990). In William & Mary Quarterly 3s 49, no. 2 (1992): 395–97. Review of David Buisseret, ed., Monarchs, Ministers, and Maps: The Emergence of Cartography as a Tool of Government in Early Modern Europe (Chicago: University of Chicago Press, 1992). In Cartographic Perspectives, no. 15 (1993): 22–24. Review of Denis Wood, The Power of Maps (New York: Guilford, 1992; London: Routledge, 1993). In Journal of Historical Geography 20 (1994): 220–21. Review of Robert W. Karrow, Jr., Mapmakers of the Sixteenth Century and Their Maps: Bio-Bibliographies of the Cartographers of Abraham Ortelius, 1570 (Chicago: Speculum Orbis Press for The Newberry Library, 1993). In Annals of the Association of American Geographers 85, no. 1 (1995): 229–31. Review of Jeremy Black. Maps and Politics (London: Reaktion Books, 1997; Chicago: University of Chicago Press, 1998). In Journal of Historical Geography 25 (1999): 103–4. Review of Felix Driver, Geography Militant: Cultures of Exploration and Empire (Oxford: Blackwell, 2001). In Times Higher Education Supplement, no. 1509 (19 Oct 2001): 28.
Review of Mary Pedley, ed., The Map Trade in the Late Eighteenth Century: Letters to the London Map Sellers Jefferys & Faden, Studies on Voltaire and the Eighteenth Century, 2000:06 (Oxford: Voltaire Foundation, 2000). In Imago Mundi 54 (2002): 160–61. Review of Ian J. Barrow, Making History, Drawing Territory: British Mapping in India, c. 1756–1905 (New Delhi: Oxford University Press, 2003). In Journal of Imperial and Commonwealth History 33, no. 1 (2005): 125–27. Review of Dov Gavish, The Survey of Palestine under the British Mandate, 1920–1948, RoutledgeCurzon Studies in Middle East History, 3 (London: RoutledgeCurzon, 2005). In Imago Mundi 59, no. 2 (2007): 241–42. Review of Avraham Ariel and Nora Ariel Berger, Plotting the Globe: Stories of Meridians, Parallels, and the International Date Line, Explorations in World Maritime History (Westport, Conn.: Praeger, 2006). In The Historian 72, no. 1 (2010): 242–43. Review of J. H. Andrews, Maps in Those Days: Cartographic Methods Before 1850 (Dublin: Four Courts Press, 2009). In English Historical Review 126 (2011): 1205–6. Review of Franz Reitinger, Kleiner Atlas Amerikanischer Überempfindlichkarten (Klagenfurt: Ritter Verlag, 2008). In Cartographica 46, no. 1 (2011): 55–57.